Nothing stands still for very long here at The Lace Market Theatre and we are making great progress with putting together our 2014/15 season already. The final programme will be realised in the New Year but we wanted to share details of one exciting production that is already confirmed. If you are attending our Christmas show 'The Firebird' this month why not take the opportunity to book for next year's Christmas show at this years prices? 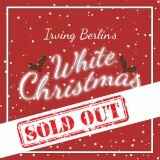 We are delighted to announce that we will be performing the hugely popular musical 'White Christmas' by Irving Berlin for an extended from December 12th-20th 2014. Full of popular hits such as 'Happy Holidays', 'I've Got My Love to Keep Me Warm', 'Blue Skies', 'Sisters' and of course 'White Christmas', we expect this to be a sell-out hit so why not book before January 31st to take advantage of our 'frozen' prizes! NB: For members wishing to take advantage of the early bird offer, please contact the box office to reserve your ticket as membership discounts for next season can not be applied until memberships are renewed in the summer.